Together in the AllSeated community, we’ve pioneered a game-changing revolution in the event industry that will assist you in creating venue layout floorplans like never before. One of the biggest benefits of modern day marketing is that venues of all sizes now have many more options to showcase their unique venue layout features and capabilities. AllSeated makes it simpler for venues to build a powerful and impactful presence, and market their services in a highly effective manner. Event organizers and planners are increasingly savvy and have higher expectations when they shop venues. Less than professional sales or marketing collateral along with a lack of technological capability can lead to a lackluster first impression which can quickly become a turn-off to future business. The question always asked by an event organizer or planner is, “How will my set-up look on the day of the event within this specific venue layout?” For this reason alone, it’s critical for venues today to provide a collaborative way to work with event organizers and planners on their floorplans so they can view both 2D and 3D layouts, take virtual tours, and stay up to date on in realtime on their events. Event technology and venue designer tools are more important than ever before! With AllSeated, easily create a venue layout design to-scale, with many additional benefits including 3D viewing, virtual walk-throughs, seating chart arrangements, and more! Did you know that one in every ten events in America is created in the AllSeated platform? As such, most venues already have their floorplan templates uploaded into our system. In the event that you cannot locate the venue layout design for your specific venue, you can provide us with a floorplan marked with at least one accurate dimension and our team will scale and upload it into the AllSeated platform. From the extensive furniture library available to you within your account, select from a wide variety of table and furniture sizes, shapes, and styles to meet the needs for any type of event. Place and move tables and furniture around the venue layout until you reach a desired diagram. Customize the spacing between tables, join tables and/or knock off chairs, and save venue layout templates for future events. You can even Include spacing for dance floors and entertainment while also marking exits for the room. At any time during the venue layout design process, easily switch your floorplan viewing from 2D viewing to 3D to take a virtual walk-through of the venue layout. You can view via “First Person View” or choose “Bird’s Eye View” which allows you to see your venue layout from above. Within your account you can manage permissions too. This means that you can collaborate with your client and show them the floorplan but they will not have access to making changes without your permission. Enhance your venue layout design using AllSeated’s designer tools to build tabletop and buffet displays to-scale within your floorplans. Watch this quick video to learn even more! Using the designer tools means no more guesswork. You are now able to see exactly what you can fit to-scale on tabletops. 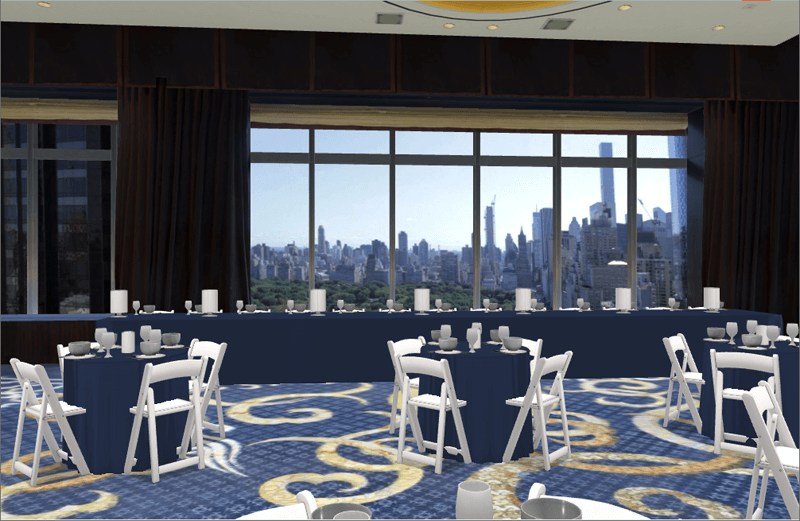 The options for the 3D table builder and buffet designer tools currently currently include place settings, flowers, centerpieces, linens, and buffet pieces, with many more objects to come. The designer tools will enhance your venue layout for debut to the rest of your team and clients to truly show what your event will look like on the day of the event. 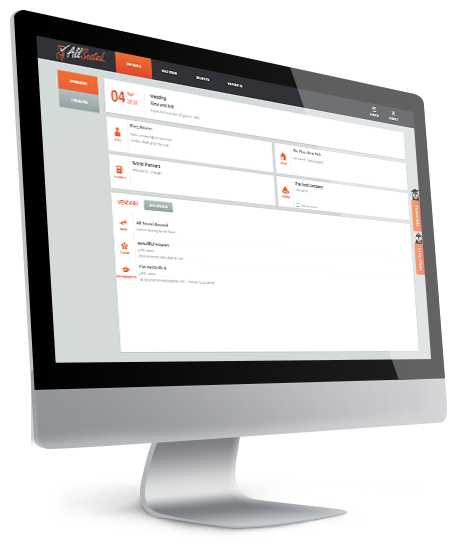 While you control the features and details within the event, you can set the permissions to allow your client access to manage their guest list and work with you to easily create their seating chart. AllSeated’s guest list provides your client with added value as it’s a tremendously helpful product for helping your client plan their event. Guest information, including names with mailing addresses, can be stored alphabetically or filtered into categories for an even more event organization. The guest list also provides spaces for meal type requests, notes, and RSVP tracking. A major benefit to storing the guest list within the event is that it features a direct link to seating. This makes it extremely simple and efficient for creating the seating chart within the venue layout. Guests can be seated at tables within the venue layout design or assigned to specific seats at specific tables, if desired. At any time while creating the seating chart, easily view in 3D to get life-like viewing of the venue layout. 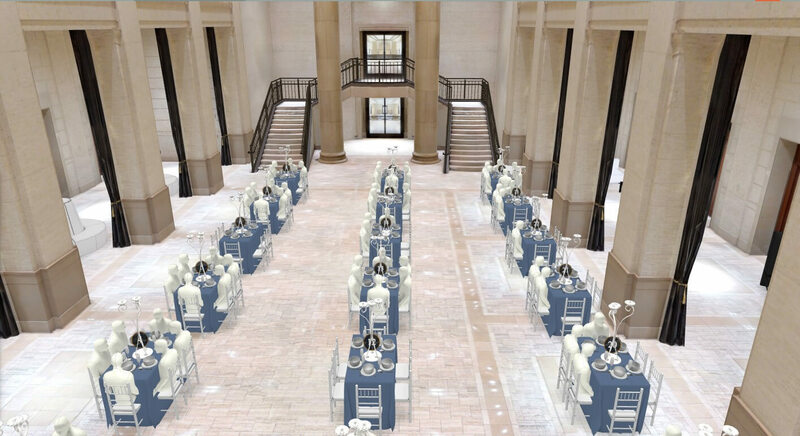 AllSeated’s latest VR technology is the event planning industry’s first and only genuine virtual reality capability. Using 360 diagramming, our VR is bringing venues the biggest ROI in the history of event technology! Through immersive virtual walkthroughs in 360 degrees, clients are able to view a venue’s property and event space regardless of where they are in the world! This vivid 3D visualization pre-delivers experiences to venues and their clients in a way that has never previously been possible. These immersive VR walkthroughs help venues, planners, and event organizers visualize the venue layout design, helping to reduce or eliminate in-person site inspections. Learn more about AllSeated’s VR in this video! Experience an event before it happens with AllSeated’s Virtual Reality. Clients can utilize AllSeated’s special VR goggles to virtually tour their future event layout design in a realistic simulation. Learn more about AllSeated’s Virtual Reality tool in this video and the three easy steps for getting started here. AllSeated’s venue layout design capabilities and virtual reality tools can really assist in the selling of a venue space and related services to potential clients. The tools allow provide organization, operational efficiency, and ability for visions to be created in advance of an actual event. Additional ideas and creative uses of a venue’s space become endless which can only increase business going forward. Forward-thinking venues recognize that the needs of their clients are rapidly changing. Venues that embrace ideas trending now will find they are well positioned to take advantage of whatever the future may bring.